nVision performance options are specified for named trees. Since PeopleTools 8, they are defined in the tree definition. It is rare to need to set different performance options for the same tree in different layouts. Therefore, it is easiest to set performance options at tree level and not at all in layouts unless absolutely necessary. 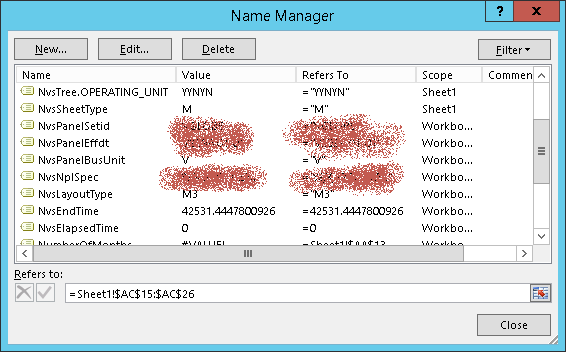 In the next post I will start to look at how the performance options control how the SQL generated by nVision. This blog post is the first in a series that discusses how to get good performance from nVision as used in General Ledger reporting. PS/nVision is a PeopleTools technology that extracts data from the database and places it in an Excel spreadsheet (see PS/nVision Overview). 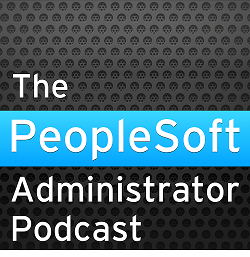 Although PS/nVision can be used with any PeopleSoft product, it is most commonly used in Financials General Ledger. The SQL queries generated by nVision are, at least conceptually, similar to data warehouse queries. The ledger, ledger budget or summary ledger tables are the fact tables. The ledger tables are analysed by their attribute columns. There are always literal conditions on the fiscal year and accounting period, there is usually a literal condition on currency code. Then there are criteria on some of the other attributes. 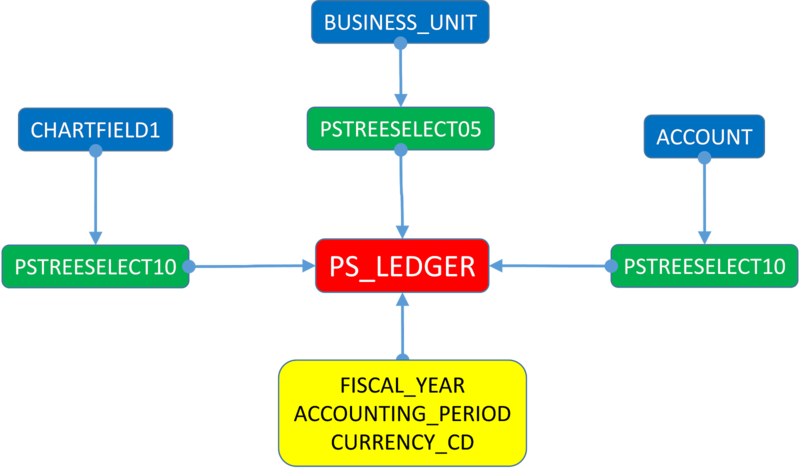 I will take an example that analyses the ledger table in three dimensions: BUSINESS_UNIT, ACCOUNT and CHARTFIELD1, but there are many other attribute columns on the ledger tables. These attributes are defined in lookup tables in the application, but their hierarchies are defined in trees. 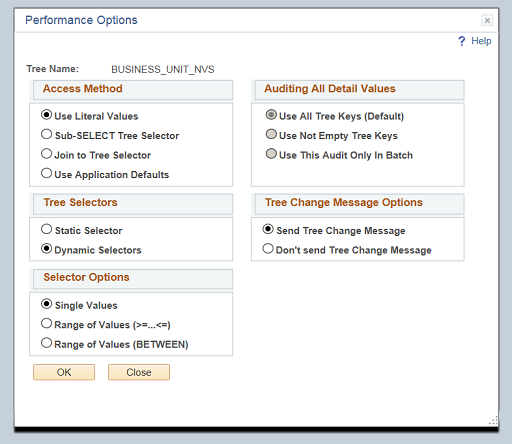 nVision reports use the trees to determine which attribute values to report. A report might report on a whole tree, or particular nodes, or branches of a tree. nVision joins the tree definition to the attribute table and produces a list of attributes to be reported. These are put into working storage tree selector tables (PSTREESELECT01 to 30). The choice of selector table is controlled by the length of the attribute column. BUSINESS_UNIT is a 5 character column so it goes into PSTREESELECT05. CHARTFIELD1 and ACCOUNT are 10 character columns so they use PSTREESELECT10. These selector tables form the dimensions in the queries. Here is an example of a SQL statement generated by nVision. The tree selector 'dimension' tables are joined to the ledger 'fact' table. 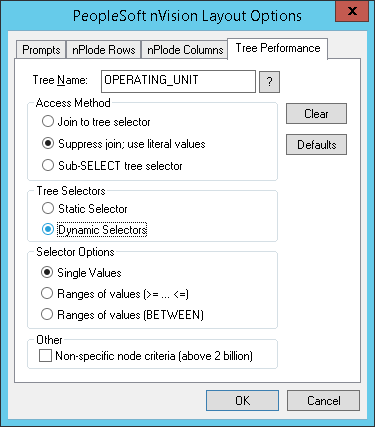 The tree selector tables are populated at runtime. Many dimensions can be stored in each tree selector table, each keyed by a different SELECTOR_NUM. Selectors can be static or dynamic. In dynamic selectors, the data is only stored temporarily for the lifetime of the report and will be deleted when it completes. So immediately, there is a challenge of keeping statistics up to date, and even then Oracle doesn't always manage to find an effective execution plan. Different selectors will have different numbers of rows, so the statistics have to describe that skew. Different nVision reports and even different parts of the same report generate different statements that can use different combinations of attribute columns. The number of dimensions can vary, I have seen systems that use as many as five different trees in a single query. Then the database needs to find the relevant rows on the ledger table for the dimensions specified as efficiently as possible. This very quickly becomes a difficult and complex problem. This series articles works through the various challenges and describe methods to overcome them. Not all of them are applicable to all systems, in some cases, it will be necessary to choose between approaches depending on circumstances.